Six US soldier were injured in an avalanche while performing advanced mountain warfare training today in the backcountry near Smugglers Notch ski resort in Vermont. They were swept 1,000′ downhill in the avalanche. The avalanche occurred in Easy Gully on the north side of Mt. Mansfield in the backcountry between Stowe and Smugglers Notch ski resorts. National Guard officials report that it took 10 minutes to locate all the soldiers in the avalanche and about 2 hours to extract them all to safety. 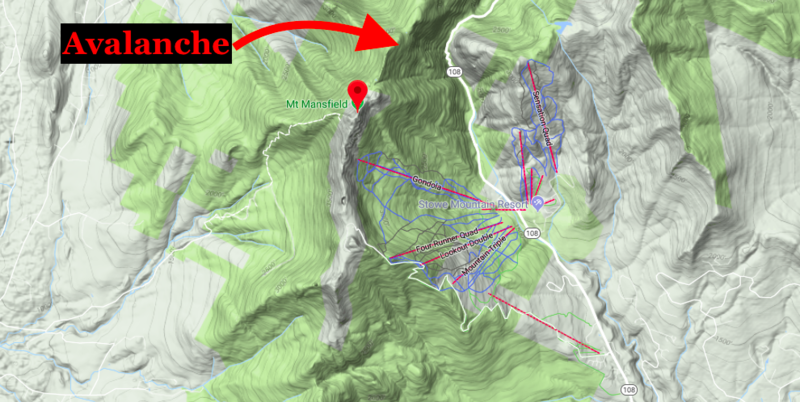 Map showing location of avalanche today off Mt. Mansfield, VT. The soldiers were not fully buried by the avalanche. 5 of the soldiers were taken to the hospital, 1 soldier returned to duty. 4 of the soldiers were students, 2 were instructors. There was another large avalanche in the Smugglers Notch backcountry involving our buddy and world record holding backcountry skier Aaron Rice this week. Avalanche Warning have been issued currently in Vermont and New York due to heavy snowfall.